Perfect Party Decorations -- With little twinkling micro LED,these starry string lights would be great to decorate your wedding or other events, or just to make twinkling centerpiece for your dinner party. 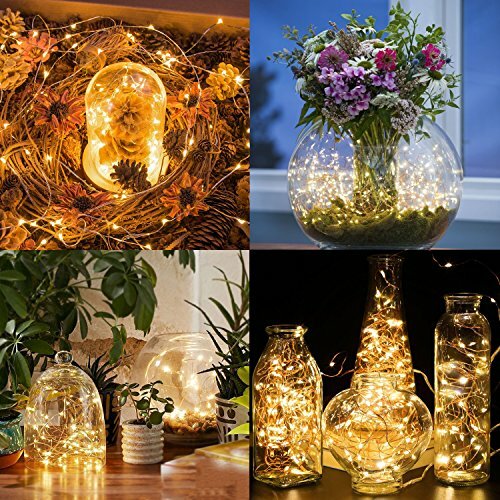 Night Lights -- Feel free to put them into a Glass Jar to make lovely night lights for your bedroom;with a remote nearby to turn them on/off without getting out of bed, enjoy your sweet dreams!!! 100% Satisfactions and Money-Back GUARANTEED: We take full responsibility for our product and customer dissatisfaction. 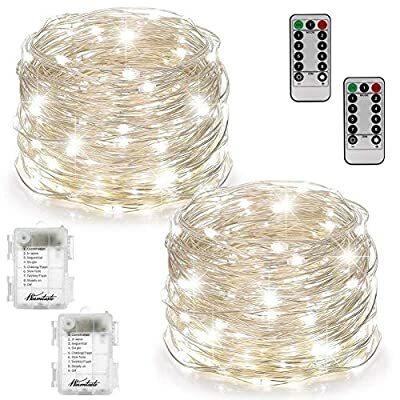 If you are not satisfied with the String Lights, just return them within 30 days for a full refund or a new replacement. No questions asked, no hassle. Wide Application both Indoors and Outdoors: wonderful decoration for your home and garden. You will find this light perfect ornament for your holiday, wedding, dinner party centerpiece and Christmas gathering. 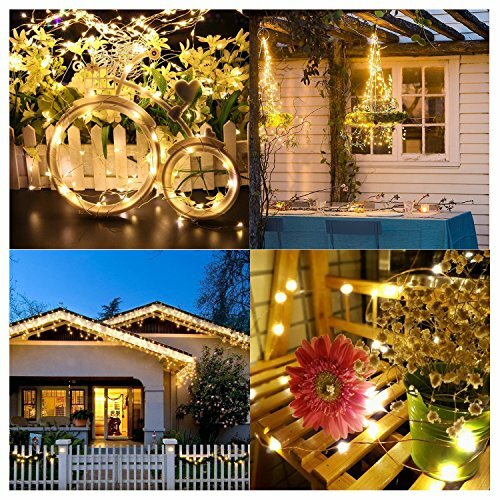 100 LEDs white lights creates a joyful and festive ambiance to your family and your friends. 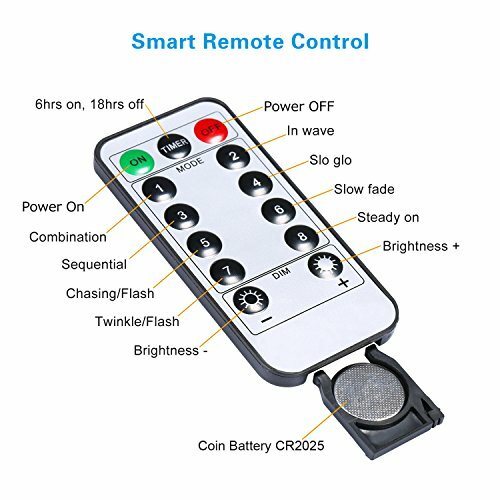 Remote control and Timer: it has a battery box with a power button and it also comes with a remote control. This upgraded version with timing function, adjustable brightness, 8 lighting modes (Combination;In wave;Sequential; Slo glo;Chasing/Flash; Slow fade; Twinkle/Flash, etc) creates vibrant, dynamic atmospheres. 8 on the remote is the steady on light mode. 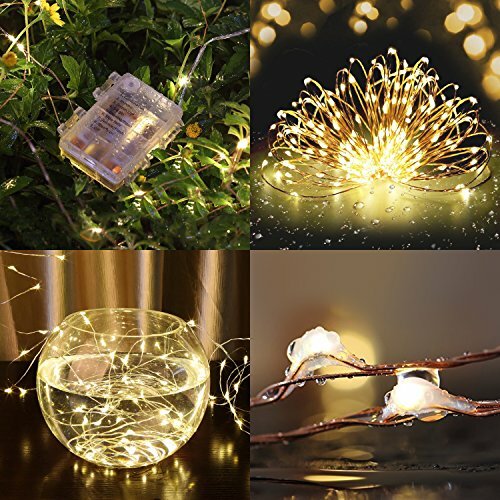 100% waterproof -- Both string lights are fully sealed, thus making the copper wire parts submersible, and the battery case is waterproof for outdoor use, feel free to put them into your water fountain to create amazing water scene.The insulated copper wire keeps the lights at a low temperature so they are safe to touch without risk of burns after many hours of use. 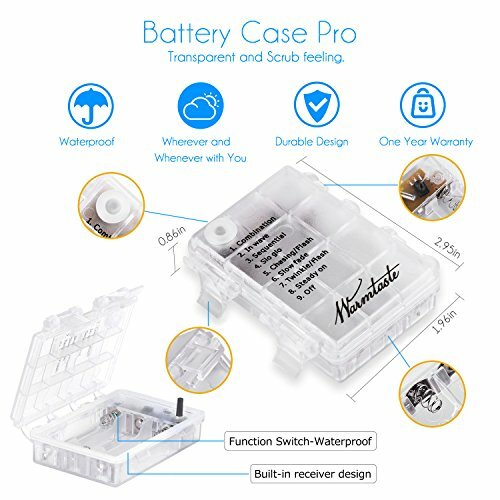 Absolutely not a Battery Eater -- Fresh AA battery(not included) can last for up to 5 days with continuously steady on Lighting, let along on flashing mode; with timer set for 6 hours on each day, they will last for more than half a month without problem. High quality and Moldable shape-This flexible sturdy copper wire can be easily bent, and shaped around plants, signs, furniture and almost everything else; Cost effective and energy efficient. It will not overheat after many hours of usage. You can safely touch it even after 14 hours of usage. The LED Starry Lights are safe for children and pets.